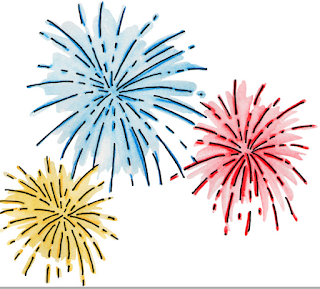 Killer Characters: Happy Independence Day! I'm so excited! My story - my very own story, FINAL SENTENCE - is on the bookshelves as of this week! My author, Daryl, and I met a few months ago. Well, more than a year ago, actually. I told her all about my life as an advertising executive and how I needed to make a change. She was all for it. She has started her career over a couple of times. She was an actress, actually. She did a lot of commercials, like the ones I used to produce. Poppity Pop Popcorn? My campaign. But that feels like a lifetime ago. And like I told Daryl, I needed a change. So when my aunt called me and asked me to move to Crystal Cove to help her open The Cookbook Nook culinary bookshop and a cafe that is an adjunct to the shop, I leaped at the chance. Mind you, I'm not a cook. I'm a foodie, though. I've tasted everything from eel to alligator. But I want to learn to cook. And I love books. All kinds of books. Did you know that cookbooks are not just for cooks? People collect them for the pictures as well as the stories inside. I'm learning so much as I delve into the stock of books my aunt ordered. What fun. And there are culinary mysteries, too, with themes like catering and coffee and more. Many of them have recipes. It's all so much fun. I'd lost my smile in San Francisco, but moving home to Crystal Cove, which is a seaside community in California, south of San Jose, north of Monterey, I know I'm going to find it again. I like to smile. Have you ever taken a big leap of faith and moved? Changed your life? Changed your career? Were you scared? I'm a little scared, I have to admit. But I'm hopeful. In case you're interested, here's an easy recipe for the Fourth of July that my aunt loves. Heat broiler and set the rack about four inches from the heating element. In a large bowl, whis the mascarpone, the honey, the liqueur and cornstarch (or potato starch) until evenly combined. Dollop the cheese mixture onto the fruit. Spread with a spoon. It will be sticky and probably won’t cover the whole thing evenly. That’s fine. Put the dishes on a tray and set under the broiler for 1 -2 minutes, but watch them like a hawk. You do NOT want them to burn. Remove from heat and cool for three minutes before serving. Dishes will be warm. Note: Amaretti cookies are almond macaroons. I found them in the grocery store in a sealed tin. Note: Mascarpone can be subbed out with cream cheese or crème fraiche. 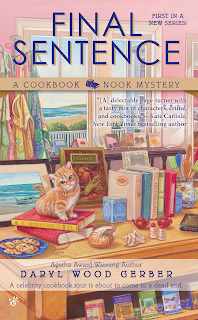 The first book in A Cookbook Nook Mystery series is out!!! You can order FINAL SENTENCE HERE. 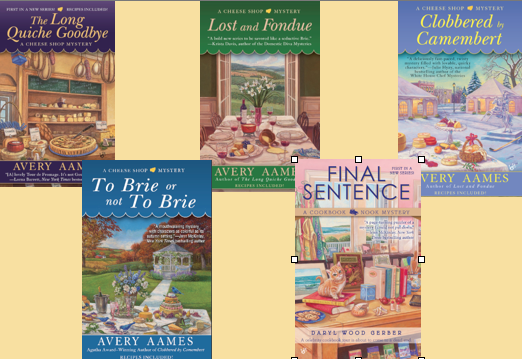 Daryl Wood Gerber and Avery Aames (author of A Cheese Shop Mystery series) are the same author. You can learn more about Daryl by clicking this LINK. "Like" my page on Facebook and "follow" me on Twitter. And if you haven't done so, sign up for the mailing list so you can learn about upcoming events, releases, and contests! You can follow and "like"and chat with my alter ego Avery Aames the same way: Facebook and Twitter. I love the Cheese Shop series and am looking forward to this one. Looking forward to finding this in the bookstore or Amazon. The main character sounds fun and who can resist a mystery that offers recipes. In fact, I'm going to try the Fruit Au gratin today. I usually make fruit salad for BBQs. It's something everyone in my family eats - including the pickiest of the kids. Sandy, fruit salad is one of my favorites. I love the mesh of flavors. Thanks, Kim. It got a great review on Cozy Mystery Book Reviews yesterday. thanx for the recipe!!! will definitely try it!!! Hi, Cyn, you're welcome. Enjoy! Melissa, thrilled to hear it! I can't wait to come to Crystal Cove to browse in your store and visit with you! Sounds like a great place to go! Thanks, Ikleback! Great to see you here. Thanks for a great giveaway. 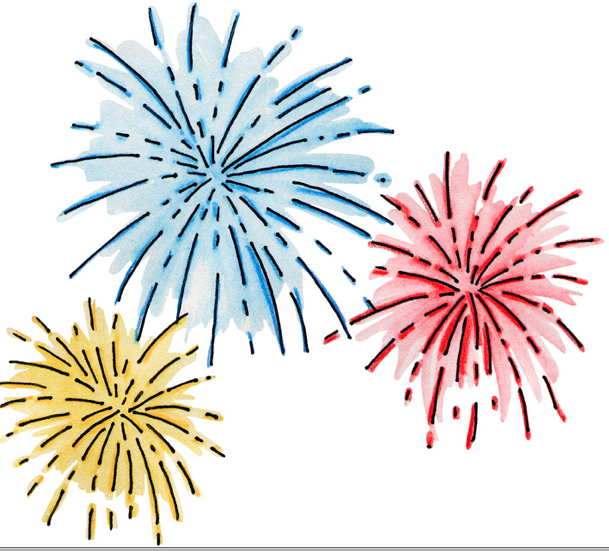 Happy 4th July. Kiki, you bet! Thanks to all who are checking in with Killer Characters. We love sharing our stories. Congrats on the new series, it sounds like a fun and interesting read. 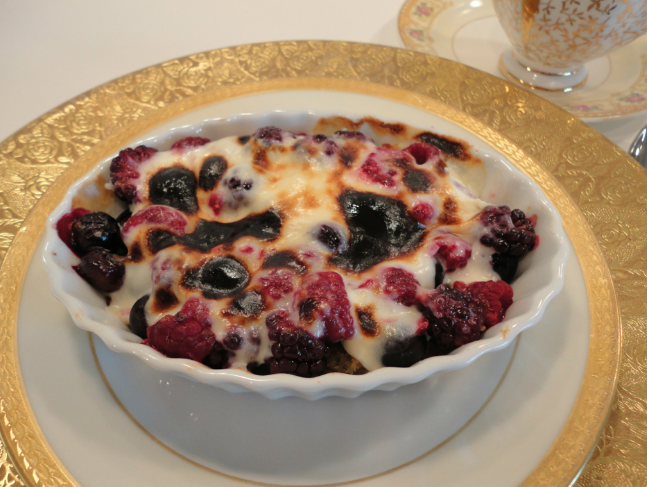 And thanks for the receipe it has all my favorite fruits. Mary Louise, you bet. I love desserts with fruit! Ingeborg, thanks for chiming in! Enjoy. Aurian, same to you. I definitely celebrate. We are blessed with freedom. May those freedoms remain intact!!! Can't wait to read the book. I'm saving my B&N coupon to get it this weekend. Maureen, great to hear! Thanks. Looking forward to seeing how your leap of faith pays off. Susie, I'm sure things will be good. What could possibly go wrong? Jenna, wishing you well in your new adventure in the bookshop and cafe. It does take a leap of faith to make changes in our lives, but taking that first step begins a whole new journey. 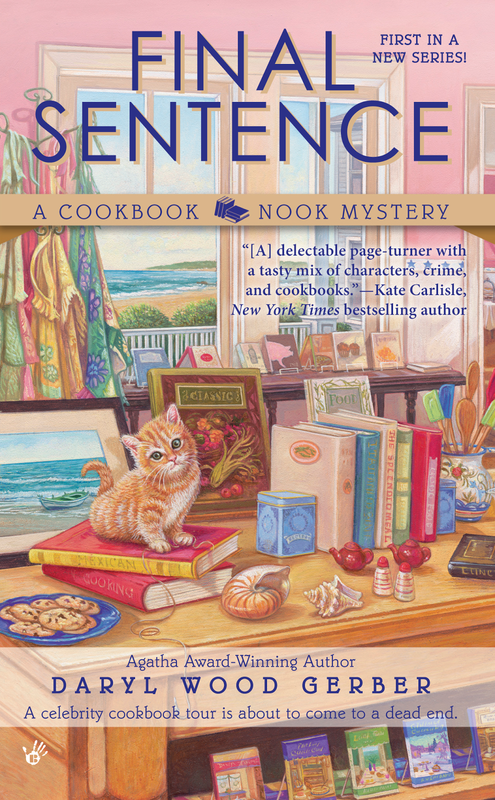 I will be interested to read your story in FINAL SENTENCE, but then I will be watching and waiting for more of your story in the Cookbook Nook Mysteries. And, Daryl, thank you for telling Jenna's story. Of course, I'd like to win this book; but, if I do not, it will be on my To Buy list as soon as possible. Donna, thank you so much. It really does take a leap of faith sometimes. I'm nervous. But I'm going to be daring with a capital D! I came to read the recipe & found a contest. Now I want both. Thanks for the contest & Happy Fourth! Nice, Robin, thrilled that you enjoyed both! BN, enjoy. It's one of my favorites. If there's a bookshop and a mystery, I am there! Looking forward to a new series. Mrs. GV, sweet. Yes, I agree. I adore bookshops. So much to choose from. So visual. And the feel of paper!!! Well done! Another wonderful book from a delightful author. Thank you, Libby, I'm so glad you enjoyed! Congratulations Jenna and Daryl on Final Sentence. I do get scared when it comes to that time when I have to look for another job. You get so comfortable with the present job, but when it's time to look, it can be scary. I'm looking forward to reading Final Sentence! I hope to win, but it's on my list! And I agree with Dru - I went through a job change 10 years ago, and it was definitely scary for a few months. Looking forward to reading FINAL SENTENCE - love the Cheese Shop Mysteries! Taurus, thank you so much! I tend to take a leap of faith every ten years or so. Keeps life interesting, that's for sure. I love marscapone, too. It's just so creamy and adds so much to a tart-like recipe. Enjoy! I'm looking forward to this new series, hoping that Tigger will be a major player in all the books because he is just so cute. Sue, Tigger is a major player. I'm so excited he came into my life. What a lovely accident. He shared a bit of his life on Dru's Musings this week, if you get a chance. He is my cuddle-puss. Change, while slightly scary, can be good. I've just made a huge change in my life with weight loss surgery which was incredibly frightening and yet, I'm hopeful that it was the right path to take. I'm so glad your new series is out - now I can live vicariously through your recipes! I can't wait to read this one since I already love your cheese shop mysteries, I know this will be a lovely new adventure!